Andrew Anderson is an up-and-coming writer who has two new series in the works for 215 Ink in addition to his current one, 31. Andrew has written several TV pilots – some in consideration – and two feature films. Andrew is currently working on a third film that he and his film writing partner are going to try to make independently. Andrew sat down with Michael Sacal, Senior Reporter of ComicBookInterviews.com, to discuss his work. Michael Sacal: Please tell ComicBookInterviews about yourself. ANDREW: Well, I have just been published professionally. I've been writing since I was in the eighth grade. 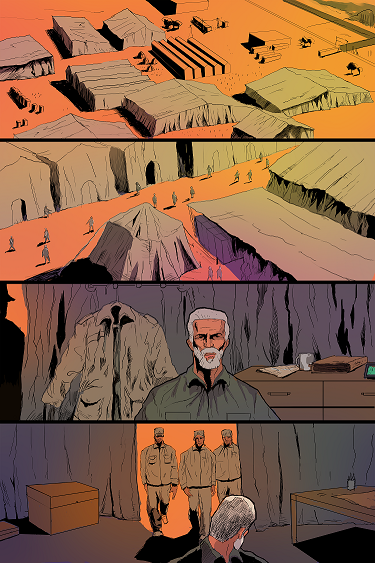 I wrote a Sci-Fi story and have always had a love for film and comics. MS: How long have you been writing comics? ANDREW: [For] 3 years, [but only] one month professionally. MS: Have you written other creators' characters, or only your own properties? ANDREW: No, but there are a few I would want to. MS: Could you please elaborate on which characters from other creators you would like to write and what you would do with them? MS: What can you tell us about your series from 215Ink, 31? ANDREW: 31 is a spy story. He has no name and has to save his sister from a past enemy. After that arc, it's about founding out who gave away his secrets. MS: What inspired 31, and how does it differ from other spy stories like James Bond and The Bourne Identity? ANDREW: 31 [came to me] when I was 16 [years old while I was] working at a water park. I thought “wouldn't it be cool to do a non-linear spy story?” It just kicked around in various forms, and still follows the original plot even [though] the plot has changed from a water park to a university. Bond is all about the gadgets. I think the only gadget I made 31 have is his knife dispenser. Bourne really inspired 31 and the first frame in issue one is homage to that fact. If you take all of Bond's gadgets away, he's just a man with fancy toys. Bourne can kill you with a pen, or a book. So I follow that model. There's even a hint of 24 in 31 in terms of doing what you feel is for the greater good. MS: What other mediums or genres have you worked in? ANDREW: I wrote some pilots, films, and music… some short stories. I released two albums, to no success. I'm currently putting the final changes on Corruption, a film I co-wrote and will executive produce. I will be fund raising to get the 10k budget for. It's ambitious, but if you love Sci-Fi, you'll love it. MS: What can you tell us, if anything, about the TV pilots you've worked on and, mostly, about your experience working in that medium? How did you first become involved in TV? ANDREW: Well, Corruption started out as a TV pilot. We pitched it around to no interest. You see, no one wants to take a risk from two unknown, unproduced kids. Brian and I are in our early 20's. So, we took what would have been the first three episodes of the series and now we're making it into the feature film. We had to cut a lot of the bigger budget things out, like a rolling jeep. I wrote the entire first season of a sitcom called Freak of Nature. It was also passed on by some big names. Maybe you'll see it one day. I became involved in TV with a project called, "The Coming Kingdom". You see, I'm a Christian, and there's not a lot of things out there that represent my view points on the end times. So, I took my view point of the rapture and wrote this pilot. The pilot was well received, however they wanted it to become more like Left Behind and have the rapture occur first. My view point is why not tell a new story instead of beating a dead horse. So, I may have burnt some bridges. Some of "The Coming Kingdom" has made its way into Occult. So, after Scarlette (the artist on Occult) finishes the two volumes of Occult, Occult at volume 3 becomes essentially "The Coming Kingdom". Film is a hard business, almost as hard as comics. At least now, I know I'm a good enough to be published. MS: What future projects do you have in the works? ANDREW: Well, 31, for the near future [and] Corruption. I'm working on Occult and Identity. Occult is “Fringe meets the Constantine film”. Identity is a standard superhero series. All three will be ongoing; one will be monthly, the other two will alternate. MS: Is there any way that our readers could help you with raising the funds for Corruption, like through Kickstarter or other similar means? ANDREW: Absolutely! We'll be doing a Kickstarter once we finalize the shooting script. 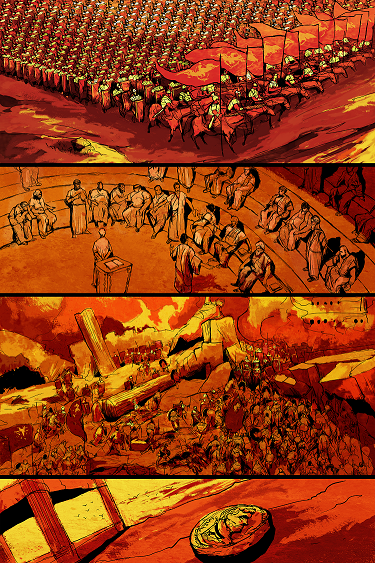 We have about 40 pages left to adapt. MS: If you could write any company’s character (s), which one (s) would it be and why? ANDREW: Ms. Marvel, but I think I would bring her into the Ultimate Universe. Definitely Superman. Superman sparked my interest in comics. I can relate to him… not the hero side, but the loneliness. I didn't have many friends growing up and sat in a fortress of my own. [It’s a] modern myth. I would also like to reboot Speed Racer if ever given a chance. Also, Doctor Who. MS: Are you aware that Warren Ellis introduced the Ultimate version of Carol Danvers during his Ultimate Galactus trilogy? How would you make her different - or similar - to the version native to the Marvel Universe? ANDREW: I am aware that she is in the Ultimate universe already. To my knowledge, she has not yet become Ms. Marvel. I would take her to the Kree home planet, where she would get powered up, and I think the first storyline I would do for her as Ms. Marvel is to take on part of the Kree-Skrull war. MS: Given the mess that DC has made of Superman over the last decade through constant reboots that have reduced him to a grown man who now wears clothes meant for a 12 year old kid, what would you to do get the character out of his funk? Where would you place your focus, on the man (Clark) or the hero (Superman)? ANDREW: It's just not Superman that has been made a mess. It is DC rebooting the damn universe every two years with the crisis and Blackest Nights. The whole DCU is a mess. As for my plans for Clark and Superman, I would do a Death of Clark Kent storyline. With dead now being "dead" in the DCU, I would kill him off for good and have Chris [Kent, the son of Zod and Ursa,] take over the mantle of Superman. I then would probably launch my own alternate universe with only one book that deals with the big three. The whole idea is to take the characters and act like they were launched in 2011 and not the mid 1900's. MS: For anyone who wants to be a writer, what can you tell them about the craft? ANDREW: If you want to write short stories and novels, read a lot of those. Read what interests you. If you want to write comics, read them go out and see if the writer of your favorite title has a script book out, and buy it. You can usually find Film and TV “How To Write” books on Amazon for next to nothing. Read film scripts too. Also, before you do one page of writing of your story do research. I do a lot of research before I even write one page of a new series. Michael Sacal is a freelance writer and archivist whose work has appeared in Faster Than Light, an anthology series published by Orang Utan Comics, and the Book of Geomancers, a Wikipedia-style online resource focused on the VALIANT Universe published by VALIANT Entertainment Inc.
Michael is a contributing writer for Surprising Comics and Red Leaf Comics who is in the process of developing multiple work-for-hire and creator-owned projects with different publishers in the United States. 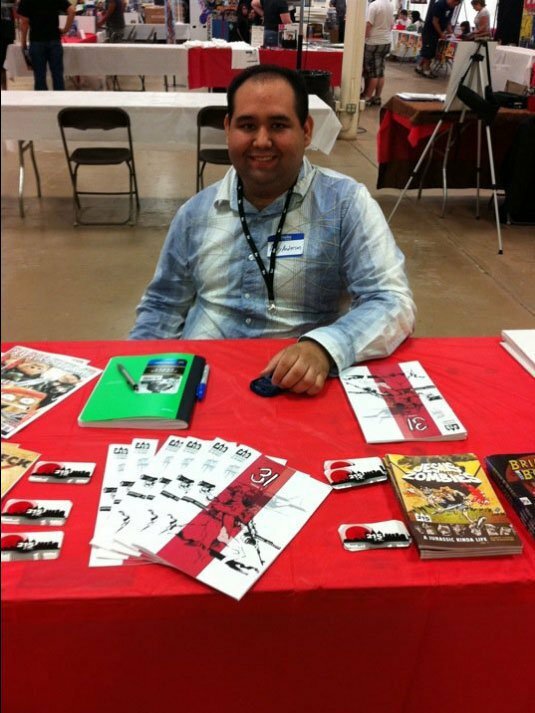 Michael holds the post of Senior Reporter at Comic Book Interviews, and can be reached at msacal@comicbookinterviews.com.